1. If the death of the saints is precious (Ps. 116:15) and the just are remembered with praise (Prov. 10:7), it is even more fitting for us to commemorate John, the highest summit of holy and righteous men, by extolling him. He leapt in the womb in anticipation of the Word of God who took flesh for our sake; he was His Forerunner and went before Him as His herald, and the Lord in turn proclaimed and bore witness that John was superior to all the prophets, saints and just men down through the ages. Everything about him surpasses human speech, and the only-begotten Son of God witnessed to him and honored him, and he has no need of any tribute from us. But this does not mean that we should keep silent and fail to honor with our words, as best we can, the one whom the Scriptures refer to as "the voice" of the sublime Word (Matt. 3:3; Isa. 40:3). On the contrary, the fact that he was proclaimed to be so great and witnessed to by Christ, the Lord of all, should move every tongue to sing his praises as much as it can. Not that we can add to his glory in any way - how could we? - but in order to pay our debt individually and together by recounting the wonders surrounding him and celebrating them in song. 2. The whole life of the greatest man born of woman was a supreme miracle. John was a prophet and much more than a prophet, even before he was born; and not only did his entire life transcend all wonders, but so did everything concerning him, both long before his lifetime and afterwards. The divine predictions of seers inspired by God described him as an angel rather than a man (Matt. 11:10; Exod. 23:20); Mal. 3:1), as a lampstand for the light (Jn. 5:35; Ps. 132:17), a divinely radiant star bringing in the morning (Jn. 1:8; 5:35), for he went before the Sun of Righteousness and was "the voice" of God's Word. What could be closer or more akin to God the Word than God's voice? 3. When the time for his conception drew near it was not a man but an angel who flew down from heaven and put an end to Zachariah's and Elizabeth's barrenness, promising that the couple who had been childless from their youth would bear a child in extreme old age. The birth of this son would, he foretold, cause much joy, as it would be for the salvation of all. "For he", said the angel, "shall be great in the sight of the Lord, and shall be filled with the Holy Spirit, even from his mother's womb. And many of the children of Israel shall he turn to the Lord their God. And he shall go before Him in the spirit and power of Elias" (Lk. 1:15-17). For he shall be a virgin as Elijah was, and dwell in the desert more than he did; and he shall censure kings and queens who transgress. What puts him above Elijah, however, is that he shall be the Forerunner of God, for the Scripture says, "He shall go before Him". 4. Because Zacharias considered these things beyond belief, his tongue was tied. Since he did not want to announce voluntarily the child's mysterious conception, he proclaimed it against his will by being silent until he saw "the voice" of the Word coming into the light. Having been conceived with so many great promises, he was anointed as a prophet before being born and - marvellous to relate! - passed on this anointing to his mother. Like Isaiah, he was clothed in the "garment of salvation" and the "robe of righteousness" (Is. 61:10); like Elijah he anointed someone else to be a prophet in his place (1 Kgs. 19:16), and while still unborn he equalled and surpassed both prophets in their perfection, because he displayed these attributes in the presence of the Lord. Once an unborn babe's members have been formed, it can move, but does not yet have a voice, as it is not yet living in the air. When the Virgin, who was at that time carrying God within her, appeared, even though John was in the womb he did not fail to perceive God's presence and His dispensation, but extolled it, declaring the divinity through his mother's tongue (Lk. 1:42). He leapt and rejoiced within her as - what a miracle! - he received in the Holy Spirit the fullness of the age to come in his mother's womb. 5. 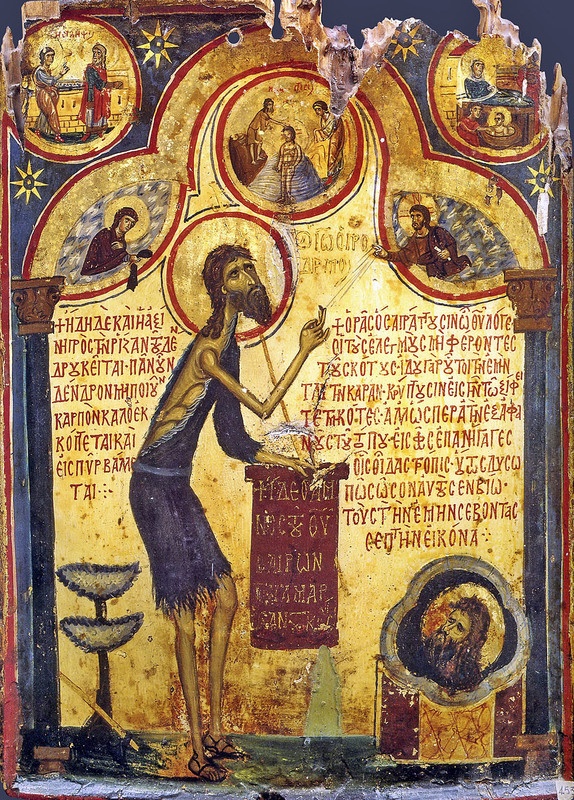 Proclaiming beforehand the mystery of eternal life, the great Paul says, "It is sown a natural body; it is raised a spiritual body" (1 Cor. 15:44). That is to say, the body will be indwelt and motivated by the supernatural power of the divine Spirit in the age to come. In the same way, John was sown and shaped in his mother's womb as a natural body, but by the mysterious anointing of the Holy Spirit while he was within her, he was shown to be a spiritual body, who leapt and rejoiced in the Spirit and made his mother a prophetess. Through her tongue he blessed God with a loud voice and declared the Virgin who was with child to be the Mother of the Lord, and he addressed her unborn Babe as the fruit of her womb, proving that she was at the same time both pregnant and a virgin (Lk. 1:41-45). 6. John did not merely, in the words of the Scripture, choose the good before knowing evil (Is. 7:16), but while still unborn, before knowing the world, he surpassed it. Then once he was born he delighted and amazed everyone by reason of the miraculous events surrounding him, because, it says, "The hand of the Lord was with him" (Lk. 1:66), working wonders again as it had in earlier time. His father's mouth, which had been closed because he had not believed in the child's strange conception, was opened and filled with the Holy Spirit, and he prophesied, among other things, about this his son, saying, "And thou, child, shalt be called the prophet of the Highest: for thou shalt go before the face of the Lord to prepare His ways; to give knowledge of salvation unto His people" (Lk. 1:76-77). Once this divine child, this living instrument of grace from his mother's womb, had been conceived, he was moved by grace to rejoice in the Holy Spirit. In the same way, after being born, he grew and waxed strong in the Spirit. As the world was unworthy of him, he dwelt continuously in desert places from his earliest years, leading a frugal life without cares or worldly concerns, a stranger to sadness, free from coarse passions and above base, material pleasure, which merely beguiles the body and its senses. He lived for God alone, beholding only God and making God his delight. It was as if he lived somewhere exalted above the earth. "And he was in the deserts", it says, "till the day of his shewing unto Israel" (Lk. 1:80). 7. On what day was he shown to Israel? When the time came for the Lord to be baptized, concerning which time the Scripture says, “there is none that understandeth, there is none that seeketh after God. They are all gone out of the way, they are together become unprofitable” (Rom. 3:11, cf. Ps. 14:3 and 53: cf. 53:2–3 Lxx). Just as in those days the Lord came down from heaven for our sake, when we were all ungodly (cf. Rom. 5:6–8), because of His ineffable love, so John left the desert for our sake to minister to the Lord’s loving purpose. As men’s wickedness was then at its peak, and the loving condescension of God was beyond compare, a servant was also needed, whose virtue was nothing less than excellent, so that he could draw observers, as John did, having attracted their admiration as someone unusual with a superhuman way of life. And the message he preached was worthy of the manner in which he lived, for he proclaimed the kingdom of heaven, threatened unquenchable fire, and taught that Christ was the heavenly King, “Whose fan is in his hand, and he will throughly purge his floor, and will gather the wheat into his garner; but the chaff he will burn with fire unquenchable” (Luke 3:17). 8. He did not just make the Lord known to all with his words, but also through his deeds. He baptized Him, pointed Him out with his finger, recommended Him to his own disciples, and bore witness in all ways that this man was the Son of the Father, the Lamb of God (cf. John 1:29, 34–36), the bridegroom of the souls that draw near to Him (John 3:29), He who bears the sin of the world (John 1:29), takes away defilement, and brings instead His gift of sanctification. Once John had prepared the Lord’s way, according to Zacharias’s prophecy, had fulfilled everything which he had been sent to do, had gone before Him, and had baptized Him in the Jordan, he conceded to Christ the rôle of addressing the assembled crowds and teaching them, and withdrew from the multitude, handing them over to the Lord. As Herod, the son of that Herod who slaughtered the infants (Matt. 2:16), had not succeeded to all his father’s power, being merely a tetrarch, but had exceeded him in evil, living in immorality and presenting the Jews with an example of wickedness, John was unable to keep silent. (How could he, as he was “the voice” of the Truth? Matt. 3:3, cf. Isa. 40:3 Lxx.) He accused him on account of his other evil deeds, but especially concerning Herodias, his brother’s wife, whom he had seized and illegally wed. “It is not lawful”, said John to Herod, “for thee to have thy brother Philip’s wife” (Mark 6:18). Finding reproach, or rather, the reproaches, unbearable, he added this to his other evil acts, that he shut up John in prison (Luke 3:20). 9. Philip was also Herod’s son, and was tetrarch of another region. After the cruel murder of the infants had deranged their father, Herod (Matt. 2:16), he fell victim to misfortunes and incurable, unbearable illnesses, and out of extreme folly and great pain he killed himself. It was then that the angel said to Joseph in Egypt, “Arise, and take the young child and his mother, and go into the land of Israel: for they are dead which sought the young child’s life” (Matt. 2:20). When this Herod’s life came to an evil end, Caesar, who held universal authority at that time, divided Herod’s realm into four portions. He put other men in charge of two of them, but made Herod’s sons, Philip and Herod, tetrarchs of the remaining parts. That is why the evangelist Luke says that Herod was tetrarch of Galilee, and his brother Philip tetrarch of Ituraea and the region of Trachonitis when John appeared by the Jordan preaching the baptism of repentance (Luke 3:1–3). 10. It was this young Herod who, as Matthew and Mark relate, laid hold of John, and bound him, and put him in prison, because he had been accused by John on account of Herodias, his brother’s wife, whom he had taken as his own (Matt. 14:3, Mark 6:17). Luke says that Herod, being reproved not just on account of Herodias, but “for all the evils which he had done, added yet this above all, that he shut up John in prison” (Luke 3:19–20). Why do the other evangelists refer only to the accusation concerning Herodias? John was shut up in prison for many other reasons as well, especially because of all those actions of the evilly-inclined King, for which he had been rebuked by John, and so could not bear him to speak freely. However, the sole cause of John’s head being cut off was the adulteress, who by her own efforts and wiles accomplished the deed and saw it through to its conclusion. She inwardly cherished malice against John, who was reproving and opposing Herod for his unlawful act, and she wanted to kill him (Mark 6:19), for there was no other way to silence what she took to be an accusation against herself. The abomination in which she was involved did not have just one or two aspects, but was highly complex. It was a matter of adultery, the most shameful of sins, and adultery committed by none other than the brother of the adulteress’s husband, the father of her daughter, while the daughter was still alive. Even if the husband had died, his brother could not marry the widow according to the law of Moses (cf. Deut. 25:5, Gen. 38:8), but Herod secretly planned their union while his brother was alive and had a daughter. Nor did he do this shameful deed secretly or with any sort of dissimulation, but accomplished the abomination openly and shamelessly. 11. Completely given over to evil in this way, and unable to endure censure, he shut up John in prison. But this imprisonment itself became an even greater reproach to him, as people heard about it and saw it, and the news circulated everywhere. As a result, Herodias deeply resented John, and inwardly wanted to murder him, but could not. “For Herod”, it says, “feared John, knowing that he was a just man and an holy” (Mark 6:20). Although Herod feared John on account of his outstanding virtue, he had no fear of God, from whom men receive virtue. Also, even though he knew him to be a just and holy man, he did not fear John in his own right, but feared him because of the masses, who, as Matthew tells us, “counted him as a prophet” (Matt. 14:5). According to his account, not just Herodias, but also Herod himself wanted to put him to death, but feared the multitude. adulteress’s murderous purpose, and would himself have put John to death, according to Matthew, but feared the multitude (Matt. 14:5). It was not that he dreaded some sort of resistance on their part, but just that they would condemn him, because they counted John as a prophet. He knew that everyone was aware of John’s virtue and grace, and, being reliant on the good opinion of the common people, he feared their criticism. As he was seeking praise from them, in some respects he still feigned obedience and reverence towards John. 13. Herodias, however, who was wise in doing evil, put an end to this fear of Herod’s, and persuaded him to murder John without just cause, in accordance with her own opinion, or rather, her deceit. Full of spite and murderous feelings, she was looking for an opportunity to put into effect her fanatical hatred of the Baptist and Prophet, while protecting herself from being blamed by the masses. “And when”, it says, “a convenient day was come” (Mark 6:21), convenient, that is, for the murderous scheme, during the celebration of Herod’s birthday, while all the people were assembled, and the men of importance were in their seats, Herodias’s daughter came in among them all, despatched by her mother for this purpose (Mark 6:22). The girl danced in the sight of all, and pleased everyone including Herod. Given that she was Herodias’ daughter, and had been sent in by her, how could she fail either to dance shamelessly, or to please Herod? Her brazen dancing so captivated the pleasure-loving King that he said to the girl, “Ask of me whatsoever thou wilt, and I will give it thee. And he sware unto her, Whatsoever thou shalt ask of me, I will give it thee, unto the half of my kingdom” (Mark 6:22–23). 14. The impudent girl went out to her mother, the one who had taught her how to leap and writhe in that unseemly way, and told her of the oath. She asked to be instructed as to what she should request, was immediately informed, and eagerly obeyed (Mark 6:24). She hurried back to the King, and shamelessly stated her demand, saying, “I will that thou give me at once”, that is, as quickly as possible, this very moment, “in a charger the head of John the Baptist” (Mark 6:25). This is what the girl asked for without blushing, and the adulteress imagined that by such means she would prevent the king being blamed for murdering the Baptist and Prophet, for she said that he would appear to be committing the murder out of respect for this oath, not out of hatred for the righteous man. “And the king”, it says, “was exceedingly sorry: yet for his oath’s sake, and for their sakes which sat with him, he would not reject her”. So he sent and beheaded John in prison, and the head was brought and given to the girl (Mark 6:2:26–28). 15. How many evils are caused by the mad desire for glory! Herod was unable to murder John because of the multitude, but he did it on account of the people sitting with him. He was exceeding sorry for the sole reason that he thought he had lost the esteem of the masses. The King was indeed hemmed in on every side. If he murdered the just man, he could expect to be blamed for the murder. If he did not, he would seem to have broken his oath. The oath was the result of pride, his fear of breaking it was due to conceit, and the murder committed to keep it was for honour’s sake. It was vainglory which assembled that whole drinking party. The Lord is right to say in the Gospels, “How can ye believe in me, which receive honour one of another, and seek not the honour that cometh from God only” (John 5:44). Because the Jews too looked for glory from men, they refused to believe in Him. They beheaded all their prophets, and destroyed Christ, the fulfilment of the prophets. The actions of a king ruled over by adulteresses and dancing girls were just as bad. He was enchanted and pleased by such evil deeds, and because of them he sold and betrayed his kingdom, and was brought to the point of doing an act such as this. 16. Brethren, our mind too suffers something similar. It was created by God to be king and absolute ruler of the passions, but when charmed by them, it is led into unnatural servitude and alien deeds. All those enslaved by sin and passions, when they are accused by their own conscience, are grieved and displeased. Their first reaction is, so to speak, to shut their conscience, as Herod imprisoned John, because he did not want to hear him. They cannot even bear to hear words of Scripture which reject sin, and encourage every kind of goodness. Finally, once they are completely in the power of the Herodias, who unlawfully shares their life – in other words, of a mind that is prone to sin – they destroy the word of grace dwelling within them, that is, their conscience. Annulling it utterly, they disbelieve and contradict the Scripture inspired by God, becoming entirely unscrupulous and opposed to God’s word, as Herod was against John. 17. Those who speak against the truth of godliness also suffer the same fate, and, to an even greater extent, do the same things. Standing accused by the prophetic, apostolic and patristic words which we offer, initially it is as if they shut them up in books, saying, “Let them stay in there, and may nobody use them or pronounce them”, for they do not listen to the Lord who tells us, “Search the scriptures; for in them ye shall find eternal life” (cf. John 5:39). Subsequently, led into something worse by Herodias, their own impious imagination, they serve them up slaughtered on a plate, destroyed by their own writings, for the malicious joy of those who agree with them, and to their detriment. 18. Herod, therefore, is an example of everything evil and impious, whereas John is the pillar of all virtue and godliness. Herod is the fullness of wickedness, the power of ungodliness, the tool of lawlessness, is absolutely carnal, and lives and thinks according to the flesh. John, by contrast, is the summit of all the God-bearing men down through the ages, the visible resting-place of the gifts of the Spirit, who bears the Name of divine grace, and in whom all piety and virtue dwell. Two images are set before us today, extreme opposites at odds with each other. The one seems to bring a little enjoyment and honour in the short term to those inclined to live after its example, then delivers them up to unceasing, unbearable disgrace and affliction. The other gives those who look towards it short-lived suffering, then bestows on them glory and divine enjoyment, which are beyond description, true and eternal. If we live after the flesh, imitating the carnal Herod, we shall die, as the apostle says (Rom. 8:13). But if, through the divine Spirit and with zeal like John’s, we oppose the body’s evil appetites and deeds, we shall live for ever. 19. The outcome of living according to the Spirit “is hidden now in Christ with God”, and is not yet obvious to all. But when He appears (cf. Col. 3:3–4), “we shall be like Him” (1 John 3:2), “heirs of God, joint-heirs with Christ” (Rom. 8:17), and shall attain to those everlasting and incorruptible good things, “which eye has not seen, nor ear heard, neither have they entered into the heart of man” (cf. 1 Cor. 2:9), for they transcend hearing, sight, and understanding. As for those who live according to the flesh, their pleasures are not just fleeting and temporary, but so slight and paltry that they can be compared to the husks eaten by pigs (cf. Luke 15:16). 20. Even if these carnal pleasures were everlasting, we would still of necessity prefer spiritual joys to them, since these are in all respects incomparably more excellent. If, on the other hand, fleshly delights were as great and amazing as spiritual ones, the fact that the former are transitory and the latter eternal would again make the latter preferable because they endure. As spiritual pleasures are both everlasting and beyond compare, and the delights of the flesh are pointless and short-lived, let us, brethren, prefer those which are permanent, ineffable and heavenly, rather than those which are swept away and go to ruin. Let us overlook things that are fleeting, even if they treacherously beguile our senses for a moment, and let us lay claim to the lasting and eternally indestructible good things to come. We should flee from being like Herod and strive as much as we can to imitate the Forerunner’s grace, especially those of us who live as monks, whose manner of life is set apart, and is more akin to the solitary life of the Prophet and Baptist in the desert. As a prophet, he foresaw that it would be the order of monks who would be able to some extent to emulate him, and his head was cut off as he struggled, not for the sake of godliness, but for virtue, so that we too might be ready to resist sin to the point of death, in the knowledge that he who puts the passions to flight through virtue will receive a martyr’s crown. Just as sin is a lesser evil compared with godlessness, so it follows that putting yourself at risk for virtue’s sake is even better than doing so for godliness. For anyone who lays down his life in this lesser cause of virtue could not fail to do the same, had the need arisen, in the greater cause of godliness. 21. That is why the greatest “among them that are born of women” (Matt. 11:11), the preacher of repentance and the Lord’s Prophet and Herald, had his head cut off in the struggle for virtue. Nor was he just the Forerunner of Christ, but also of His Church and particularly, brethren, of our monastic way of life. He was born of Elizabeth, a barren woman, and we were born of the Church of the Gentiles of whom it is written, “Sing, O barren, thou that didst not bear; break forth into singing, and cry aloud, thou that didst not travail with child: for more are the children of the desolate than the children of the married wife” (Isa. 54:1, Gal. 4:27). After John was born, Herod, the murderer of infants, pursued him with murderous intent, fighting against him out of hatred for Christ, but the Forerunner found refuge in the desert, which he loved more than the world, and there he dwelt. In the same way, the Herod of our minds attacks us after our spiritual birth, persecuting Christ now through us. 22. So let us too flee from the world, and take refuge in those schools of virtue dedicated to God, that we may escape from Herod’s pitiless soldiers armed with spears and swords, who stir up the passions, by means of which he inflicts spiritual death, separating men from God. This is the death that comes upon us through the windows of our senses. It came about originally by means of these senses, and dragged down the human race, banishing our forebears from eternal life. Eve heard the evil one’s malicious counsel: she saw, succumbed, ate, died, enticed the man, and shared the taste and the fall with him. Incapable of withstanding a single trial, they immediately gave heed to a treacherous word, and were overcome by a beautiful sight, although they were not yet subject to the passions but dispassionate, wandering about in a place free from passions. So do you think that we, who have been born and brought up in the world, can avoid being harmed, or suffering wounds and a change for the worse in our inner selves, when we are faced with the passions in their various guises, and with hearing and joining in prolonged and unseemly conversations? That would be absolutely impossible. 23. For these reasons the Fathers imitated the Forerunner of grace, bade farewell to the world, and fled the company of those devoted to it. Some inhabited the desert and attracted to it many of those born later. Others led ascetic lives within sacred enclosures and organized spiritual communities, and we associate ourselves with various ones of these in emulation of the Fathers, and live in these hallowed folds. We should not, however, merely dwell in them, but also live as the Fathers lived. Even these other paradises of God on earth are not without the tree of knowledge of good and evil, or the wicked guide. Instructed by the examples from former times, however, we can pay heed to the sole wise and good Counsellor, and follow in the steps of those who were, and are now, obedient to Him, imitating their conversation, to use the apostle’s expression (cf. Heb. 13:7), as we have seen the outcome of their lives. There are also wild animals and cattle in the desert and in these hallowed sanctuaries, and we must greatly fear lest any of us should fail to imitate John’s way of life, as far as is possible, and be reckoned among the senseless beasts and become like them (cf. Ps. 49:12, 20). 24. What else? John always had his head uncovered as a sign of unceasing prayer, and boldness towards God, for when a man prays he should have his head uncovered, according to the apostle (cf. 1 Cor. 11:4), that with unveiled face we may reflect as a mirror the glory of the Lord (cf. 2 Cor. 3:18). Let those who are bound up with the world cover themselves on account of these harmful things that surround them, or rather, are innate within them, and their constant impediments, since they cannot pray unceasingly as we do. We, on the other hand, who have abandoned the world in a good cause, should withdraw our thoughts from it as well, uniting our minds to Christ in psalms and hymns and spiritual songs (Eph. 5:19), and make ourselves a dwelling-place for the saving Name (cf. Acts 2:21, 38; 4:12; 10:43), remembering Him for whose sake we left the world. For anyone who has retired from the world and this life’s concerns for His sake obviously longs for union with Him, and this is brought about by the constant remembrance of Him, which purifies the mind. 25. Let us cleanse the eye of our understanding by reaching up with our deeds, words and thoughts towards God. There would be nothing to drag us down if we were only to look, as far as we can, at John’s way of life. He went around without a roof over his head, so let us be content with a small shelter, and may each one of us gladly accept the modest room which the superior gives us, remembering him who was homeless all his life long. He was satisfied with “locusts”, the name of a type of fruit, and “wild honey” (Matt. 3:4, Mark 1:6), a plant which grows wild in the desert, the roots of which were used as food by the Fathers who dwelt there after him. 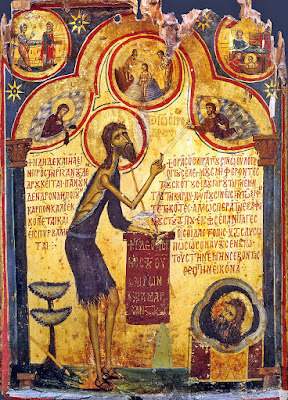 So he lived on fruit and plant roots, or honey from the mountains, had only one garment, and wore a girdle of skin about his loins, thus showing symbolically that he carried about in his body the death of the passions, and also that he possessed the virtue of poverty, teaching it to us through his actions. How well off we are in everything necessary for nourishment and clothing! We have receptacles and storehouses full of grain and wine, kitchens and bakeries, and absolutely everything we need. 26. Let us thank God who gives us these things, and His Forerunner, for through Him we gather them in effortlessly, as if they flowed towards us from a spring. Let us accept them to His glory, rendering Him thanksgiving through our deeds. If we are content with these provisions, which are common to everyone in the monastery, we are not far removed from John’s poverty and self-control. For although he was unrivalled in all respects, yet we are nourished from God’s stores, just as he was fed by God. If, on the other hand, we have possessions and stocks of our own, that is something terrible which separates us from the communion of the saints. Anyone who has withdrawn from the world and has property, which he either brought with him or has acquired here, carries the world around with him and never leaves it. Even if he is on the Holy Mountain itself, dwelling in those monasteries, which are an image of the heavenly country, as far as he is concerned, he profanes the place and stops it being superior to the world. Such a person will obviously be condemned for regarding God’s sanctuary as somewhere ordinary. But did John, the Lord’s Baptist and Herald, leave that peaceful wilderness? He did, but he was sent by the Lord to give His people knowledge of salvation and to rebuke the disobedient, which is why he was beheaded by them on this day. It was not fitting that he should die a natural death, for dying naturally is the sentence of Adam’s transgression, which was not binding upon the minister of the commandment, who had obeyed God even from his mother’s womb. The saints should lay down their lives for the sake of virtue and godliness, as the Lord commanded, so a violent death for the sake of what is good is more appropriate for them. That is also why the Lord experienced such a death. It was necessary for John’s death to herald the death of Christ, such that he should go before the Lord, in accordance with his father’s prophecy concerning him, to give knowledge of salvation to them that sit in the darkness of hell (cf. Luke 1:76–77, 79), that they too might run to obtain blessed eternal life in Christ. 27. May we all attain to this by the intercessions of him who obtained it even from his mother’s womb, proclaimed it to those on earth and those under the earth, and guided, and continues to guide, all towards it by his words, deeds and prayers to God, in Christ Himself our Lord, to whom alone belongs eternal glory. Amen. From Saint Gregory Palamas: The Homilies (Mount Thabor Publishing, 2009).